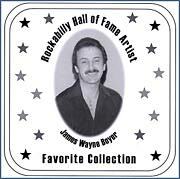 James Wayne Boyer was born September 17, 1941, the eldest of three children, in St. Genevieve, Missouri. Music was in his blood, as his mom played the stand up bass, and his dad played guitar. When Jim was three years old, he won a singing contest. At age 10 or 12, he started singing with small bands, and at age 15, he learned that the Red Kohm Band needed a drummer. Red bought a set of drums for Jim, which he started playing, and singing. Each week, Jim paid Red back a little for the drum set. At age 19, Jim teamed up with Billy Swan who had written Lover Please. Jim and the Rhythm Steppers recorded Lover Please on the '`A" side of a 45, and they recorded a song Jim wrote on the "B" side at Bill Black's Studio. Later, Clyde McPhatter recorded Lover Please and made it a hit. In 1962, Jim came to Detroit for a two-week engagement, and ended up making Michigan his home. He formed the band, Jimmy Boyer and the Newports, one of the top name bands in Detroit and Canada, and recorded Little Miss Heartbreak and Summertime in the early 60s. Then, in the late 60s, he formed a band called 6 O'Clock News, who recorded Working on the Road and Train Ride Down Jasper Way. In the early 70s, Jim worked with the band, Marshall, Newell and Boyer and recorded several songs. In the mid 70s, he went on the road with Billy Swan, playing drums and singing, while his brother, Rick Boyer, played bass. The Billy Swan band, based out of Nashville, TN, toured the U.S. and overseas for several months. In the late 70s, Jim worked on the road with Bob Lumen playing drums and Steve Warner was playing bass in this band. In 1980, Jim had a brain tumor removed at Tufts New England Medical Center in Boston, MA, the only place in the U.S. where surgery was being performed for this particular type of tumor. After a recovery period, Jim worked full time in various bands around Detroit and its suburbs until D.J.s and Karaoke took over.